We have searched the world over to bring you the highest quality bells with built-in longevity. Hand-crafted in Northern Italy, these 6-inch (15.24 cm) chrome-plated brass bells are guaranteed to please with their richness of sound and beautiful finish. 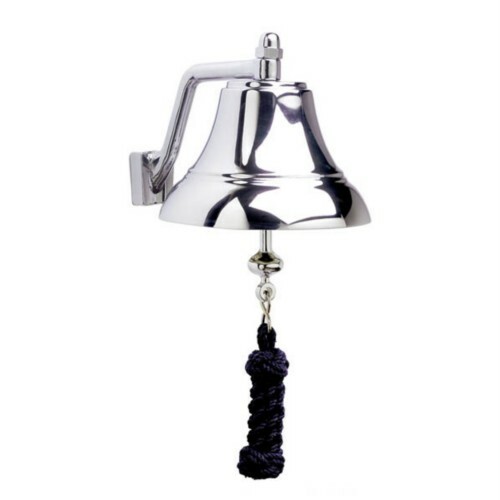 These stunning bells have a high copper content which makes them stronger than most bells available on the market. They are chrome-plated cast brass, polished to a mirror finish; and they produce a wonderfully rich tone when struck. The sturdy chrome-plated brass bulkhead/wall mounting bracket allows them to be easily lifted from the bracket for removal and storage when not in use. The blue, hand-tied, monkey fist lanyard adds a nautical flare as the finishing touch.